The Fiat 500 can be had for as little as $15,500, or as much as $724,750 if you have luxury gadget company Stuart Hughes make you one of their lavishly embellished customs. 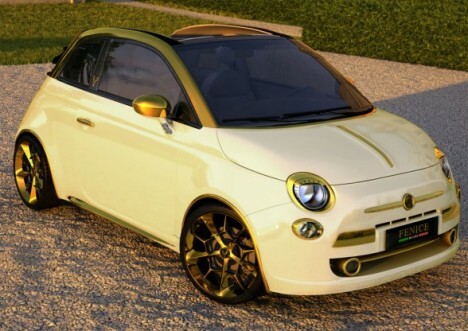 The "Fiat 500C La Dolce Vita Gold and Diamonds 200hp," as it's officially called, was actually a one-off 500 Abarth convertible commissioned by an antonymous Chinese client, or so the story on the SH website goes. It's got gold. It's got diamonds. It's got ... teak. It's got ... uh ... a redesigned steering wheel and, well golly, new carpet. It also comes with a 24K gold and diamond iPad. Suddenly it seems like a bargain, no? And you thought the Aston Martin Cygnet was a premium subcompact. Nice CGI walkaround. I wonder if they'll ever get an order and actually get to build one?